If many countries claim having a place to see the best sunsets in the world, then it is different it is in South Korea. Precisely at the Sunrise Peak, you can see the beautiful sunrise. Sunrise (sunrise) adorned with a golden glow on the horizon at dawn is a beautiful sight on the face of the earth and Sunrise Peak or Seongsan Ilchubong believed to be the most beautiful place to watch sunrise in South Korea. Seongsan Ilchubong located near the town of eastern Songsan-ri, is a volcanic crater with vertical cliffs. Crater having diameter of about 600 meters with a height of 90 meters. About 99 sharp rocks surrounding the crater which also makes it resemble a large crown. On the east and north sides of the crater, you will find a cliff. While on the northwest side is a green hill with a slope overlooking the village of Seongsan. Sunrise as seen from the crater to be one of the best scenery in South Korea. Because most eastern tip of Jeju Island is the first place to welcome the dawn, then no doubt you will see a beautiful sunrise view. Another sight not to be missed at the top of Seongsan Ilchulbong are flowers which bloom bright yellow during the spring. Seongsan Ilchubong also an arena hiking and horseback riding locations. 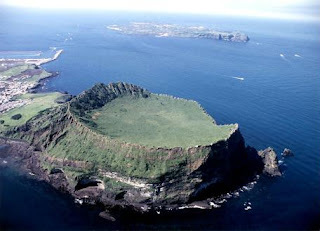 Sunrise Peak is the name of fame off Jeju Island, South Korea's largest island. Beautiful island located off the coast of South Korea is a place of fantasy and mystery in which the Korean people regard it as the most beautiful islands. 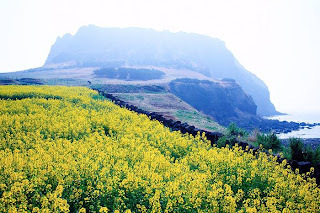 Jeju Island is a favorite destination for honeymoon for locals and foreign tourists. Attracts thousands of tourists for Jeju volcanic scenery, beautiful beaches, waterfalls and hiking trails are long and winding. Since the number of tourist attractions, landscapes and volcanic stretch of beach makes Jeju given the nickname "Little Hawaii" and is said to be among the 10 top-ranked tourist destinations of the world.